PHUKET: Local marine biologists are hoping to determine what killed a young dugong found washed up on a remote beach on the east coast of Phuket yesterday (Jan 26). 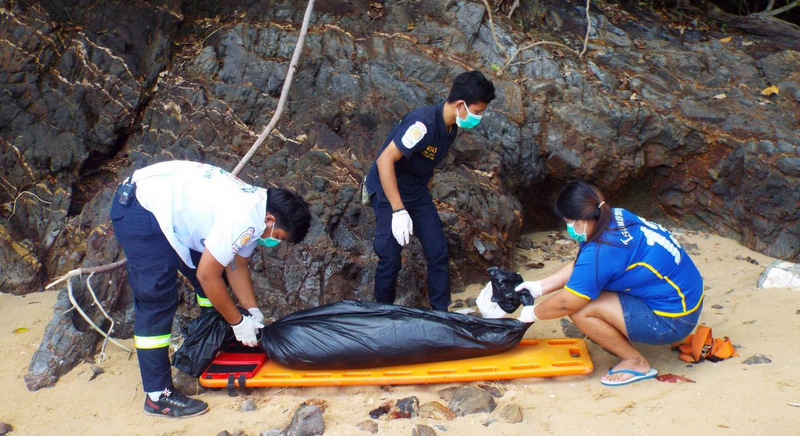 Jaruwan Chuayseng, 25, a rescue worker from Phatthalung province, notified local Kusoldharm rescue workers at about midday that a dugong had been found dead on Somkiet Beach, also called Laem Nga Beach, on Koh Siray, east of Phuket Town. Lt Wipawan Wattanangerntanong of Phuket City Police along with researchers from the Phuket Marine Biological Centre (PMBC) arrived at the scene to find the dugong’s remains in a state of decay. The dugong was 1.2 metres long and estimated to have been one to two years old was found. Its mouth had suffered a serious wound and one of its forelimbs was missing. A minor wound was also found on its tail. PMBC officers estimated that dugong died at least one week before its remains were found. The remains were taken to the PMBC research centre at Cape Panwa in the hope of determining the cause of death.